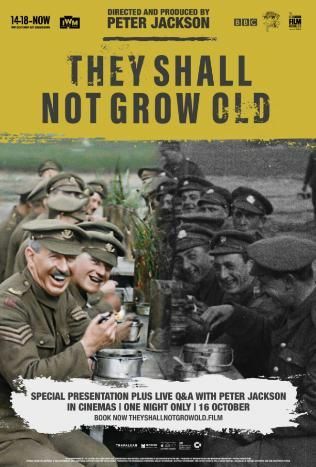 They Shall Not Grow Old is a 2018 British documentary film directed and co-produced by Peter Jackson. The film was created using original footage of World War I from the Imperial War Museums' archives, most of it previously unseen, alongside audio from BBC and IWM interviews of British servicemen who fought in the conflict. Most of the footage has been colourised and transformed with modern production techniques, with the addition of sound effects and voice acting to be more evocative and feel closer to the soldiers' actual experiences. Read more on Wikipedia.